I hope you are doing well! The first article of this series is already more than a month old. In this article I want to go into more depth regarding the business model that we are currently exploring, our hypotheses regarding this business model and the prototype we are using to test the hypotheses. Here goes! 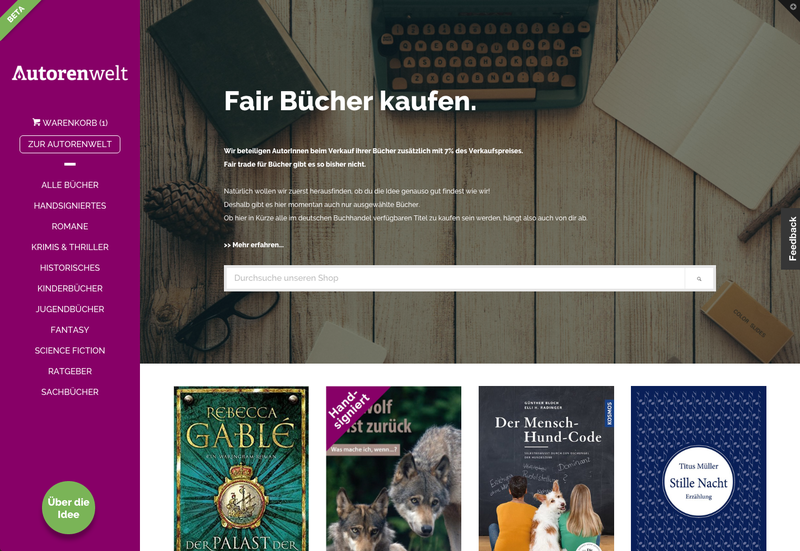 As you might remember from the first article, our business model appears to be very similar to that of a traditional online bookstore, but hinges on writers adopting the concept and telling their readers about us. Why would writers do so? Because we share with them 7% of the revenue generated by selling their books, around as much as they get from their publishers. And why would readers follow their writer’s call to action? Because being able to contribute to the well-being of the people, who write the stories that keep them up at night, is of value to them. And because, frankly, many of them have been looking for a better way to buy books for some time now. Now, if you look at our business model through the lens of the Business Model Canvas, you’ll see that in fact it is very different than that of yet another online bookstore. The value proposition for readers is enhanced, there is another customer segment (the writers) with their very own value proposition (writers might as well not exist for traditional online bookstores), and very integrally to the business model: the writers are the channel to reach the readers. We see ourselves differing from traditional online bookstores in the other aspects as well, but what I just described is the very core of how we are different. Let’s focus on that for now. To sum it up: In this business model, each writer is a multiplier for our (and their) cause, driving traffic (readers) to the store. To give you a quick example of how this makes for some interesting dynamics: in this business model marketing budget is not spent ex-ante in hopes of a high ROI, but is factored into the variable costs (cost of goods sold) as 7% of revenue (the writers’ share). Now one could argue this might be too much or too little, but as a matter of fact, budgeting for marketing is a lot less of a headache like this. This is a video of me explaining this core of our business model in November at CrowdDialog 2015 (in German). Now, fancying ourselves “lean”, our principal concern is to validate this business model and learn as much about it as fast as we can. Hence we analysed it, extracted the riskiest assumptions we had about it and formulated them as hypotheses. This allowed us to then design and run experiments in order test these hypotheses. The two riskiest (and most promising) assumptions for us are those relating to how we’re different: a) readers and writers actually have a problem that our concept is a solution for (customer segments and value propositions) and b) the link between writers and readers works (channel). Having worked with writers for about 25 years and all personally knowing a lot of people who complain about not being able to buy books “in good conscience”, we decided to jump the gun: we built a prototype right away. We felt confident enough to skip lower-tier experiments like mock-ups, interviews, landing pages and the like — or rather, we felt we wouldn’t be able to garner many additional insights from experiments like that. “Lean” purists will probably sigh at hearing this, but alas, we started building out a prototype using Shopify and Unbounce. And this prototype is actually what we still have in production right now. This prototype is the platform we’re currently using to run experiments on and test our hypotheses. We didn’t know it, when we chose Shopify as the platform for the prototype, but we have come to realise that Shopify is actually quite handy for what we are doing. The API is magnificent, documentation is excellent, support is quick, it can handle humongous amounts of product-data, and it integrates with many other SaaS out of the box. You can meddle with everything(!) you see on the front-end, either by installing a different theme and configuring that theme, or by just jumping into the code and changing anything down to the last <p>. We each set up individual development stores (with Shopify) that are online all the time and that are being deployed to automatically via a little script once you edit and save a file locally. This means that you can actually develop in your editor/IDE/VIM and see the changes live in your browser, just like it is supposed to be. We went as far as setting up a deployment pipeline with Jenkins, which we use to deploy to a staging environment and to the production shop that is live at http://shop.autorenwelt.de. So yeah, we are quite happy with Shopify, and it looks like we will be able to iterate on top of this prototype for a while before outgrowing it. In the next article I want to take stock and share some early numbers with you. Stay tuned.